Kaminoyama Castle (上山城) is located in Kaminoyama Onsen. It was originally built in early 14th century by Satomi Michinaga. There is reconstructed castle, which is also historical museum of Kaminoyama, in the spot and have a great view of Kaminoyama. It is also famous for Sakura and There is Free Foot Onsen in the castle which you can enjoy Castle and cherry blossom at the season. Admission: 400 yen for adult. 350 yen for students, 50 yen for kids. 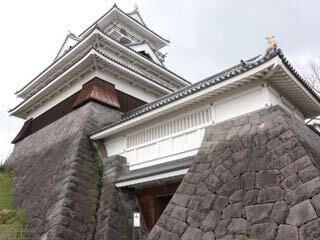 Original Castle was built in early 14th century by Satomi Michinaga. In 1514, it was taken by Date Tanemune, but in 1535, the descendant of Michinaga, Yoshitada defeated Tanemune and got back the castle. In 1622, Toki clan was moved this castle and rebuilt new castle with great garden, moats and walls. At this time, it was considered as one of the best castle in Oou. However, in 1692, Tokugawa Government ordered to destroy this castle and never rebuilt in this place. Current castle was reconstructed in 1982. There is free foot Onsen in the castle. The current Tenshu-kaku is the historical museum now and has many Katana, armors and other historical stuffs.